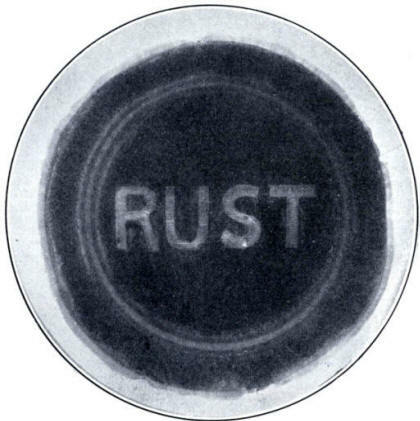 In the following figure, a freshly polished steel plate has had the word "Rust" carved upon its surface with a cutting tool. On immersion in the ferroxyl indicator the general surface has come out in red while the carved letters appeared in blue. This cause of stimulated pitting is probably very generally active on all surfaces of iron and steel which from the nature of their service cannot be treated with any form of protective coating. Boiler tubes furnish the best example of stimulated corrosion effects from this cause. The remedy should lie in truing up of all active contact surfaces even to the point of polishing if necessary. There are times when a sound boiler tube is of vastly more importance than a polished gun barrel, and when the added cost of preparing the boiler tubes would be insignificant in comparison with the danger of blow-outs from pitting. The above fact brought out by experimental investigation is also attested by the results of practical observation and experience. It has long been known in the Bureau of Steam Engineering of the U. S. Navy Department that indentations such as sandpits, or injuries on the water surfaces of boilers, always become centers of corrosion and pitting, and inspection has been as thorough as possible to guard against this danger.